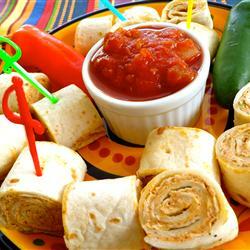 Tortilla rollups are always a crowd pleaser at tailgates. Try this simple recipe for one of your tailgates this Fall - make the night before, refridgerate overnight, then cut and serve at the tailgate! Mix cream cheese, sour cream, green onions, and taco seasoning in a bowl until well blended. Spread a thin layer of the cream cheese mixture onto each tortilla. Roll each tortilla tightly to create a long tube. Spread more of the cream cheese mixture on the edges of the tortilla to seal. Place rolls in the fridge overnight. Before serving, cut each roll into 1-inch pieces and serve with salsa for dipping.